We are happy to say that we have some really interesting Halloween creations made by some of your favorite artists. These are just a handful of the great Halloween items now available at American Harvest. We hope you’ll come into the store and see for yourself. We are decorated in a Vampire Ball theme this year. It is really fun, not too scary, and everyone has liked it. If you see anything in the pictures that you like, please give Sharon a call at 925-485-1577. Remember that we are now open 7 days a week. M-Th 11am to 5pm, Friday 10am-9pm, Sat. 10am-5pm (sometimes a little later) and Sundays noon to 4pm. We hope you’ll give us a call or send us an email…. We are so excited! New merchandise is arriving daily from our recent buying trip. We have great new “Urban French” decor, vintage style jewelry, fresh new scarves for Spring and antique “smalls” from France. Here are some pictures of these great finds! Come to American Harvest to see the entire collection and fun store displays. Antique French wine bottles direct from France! Antique photo albums, gloves and vintage style jewelry are showcased here. Combine vintage oil lamps and vintage style bird mirror for a great Urban French look! These French keys were found just outside of Paris and are at least 100-150 years old. We have a large selection of French religious antiques, including this blue velvet crucifix with Holy Water font. Another great find is this “Souvenir de Paris”, Eiffel Tower on a marble base. We have a really special collection of sterling silver mesh coin purses from France. These fun metal hearts just arrived…there are ten different messages available. Beautiful Antique French religious items, including crosses, water fonts, Missels and Bibles, marble plaques, rosaries and pictures. We also have a nice collection of prayer cards from France and Italy. Now let’s get quirky! Marilyn and Audrey images on journals, tags and matches! This Valentine is made from vintage materials by Susan. It is displayed with vintage Valentines from the 1930-1950’s. This Valentine candy box is vintage. The Urban French look is enhanced with many bird and botanical prints. The Madonna statue just arrived. She has a kind and sweet expression. St. Theresa is a favorite. This water font features this desirable saint. Here’s just a sample of the interesting jewelry that can found at American Harvest. We have a really good selection of 1930’s bisque figures. We found these metal hearts on our buying trip. We also have mercury glass hearts from the same French/Belgium company. You know that we love old cameras. Here is a very unique camera, the bellows are in near perfect condition. Sharon loves her ruffly petticoats. Did you see her wearing one at our Halloween event last August? These two are great for Spring. Also, just found in France is a collection of French alarm clocks. These vintage clocks are sold as decorative items, but I did test the alarms…boy are they loud! Here’s a grouping of new light-weight Spring scarves that arrived. We have a wonderful selection of scarves. Remember that scarves are worn year round in France, let’s keep that tradition going over here too! Large clips hold these pictures on the wall. Create this new Urban French look in your home. Come by American Harvest to see the entire selection of antiques from France, French-inspired pictures and decor, Valentine gifts, jewelry, scarves and so much more! 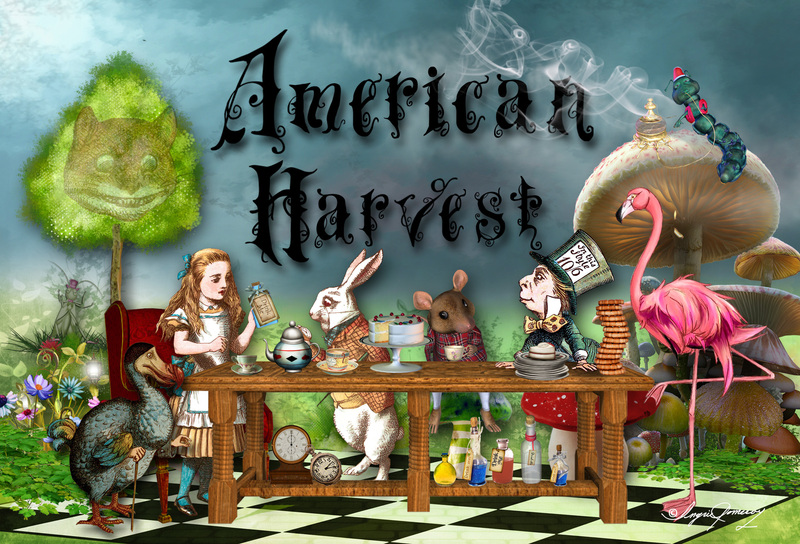 American Harvest is the best shop for unique gifts for your family, friends and of course you! Sharon and I look forward to seeing you again soon! Here are some preview pictures of the Ghost Town Halloween Party. We have been working hard to make this event fun for everyone. We hope to see you on Friday, August 24th from 7:00-9:00pm at American Harvest. We can pretty much guarantee a rootin’, tootin’ good ole time! Don’t forget to wear a hat or costume and receive a prize! Lighted pumpkins will greet you at the door. Miss Sharon’s Trading Post is loaded with great gift and decor items. Fun for all ages. Doc Rodger’s Office is open for business. If he can’t cure you of your ailments…don’t worry because he is also the undertaker! Watch out for Sheriff April…she’s also the judge and jury. This poor soul was simply riding his horse into the bank for a little withdrawal….too bad he didn’t have an account there! There is a high spirited game of poker going on here! What’s that card up his sleeve? The Painted Pony Saloon is open to all, but please leave your horses hitched to the post outside. The Cowgirl Palace has a pool table for your enjoyment….and don’t miss the Dance Hall gals with their fancy petticoats! The deputy enjoyed his stay at the Ghost Town by reading an interesting novel…probably after watching the Dance Hall gals! The coffin shaped shelving unit in the Doc’s office is full of miracle cures and ointments! Snake oil comes at a hefty price! The Doc is looking for more patients…come on in for a free consultation! Halloween delights await you at every turn. Bug poison to Bat droppings….everything for everybody! Girlie delights for you by local artists. The Trading Post has many wonderful vintage collections for you. These good ole locks are perfect for securing your treasures. Lanterns and Jack-O-Lanterns are in abundant supply. Boot Hill is a great place to visit, but you don’t want to make it your permanent home! Even the urban cowboy or cowgirl will feel right at home in these special glasses! This vintage brass horse is a great trophy for every buckaroo! Nicol Sayre’s designs, always a crowd pleaser, will capture your heart and spirit! More bottles in the Painted Pony Saloon. Well, we sure hope that you enjoyed these preview pictures of the American Harvest’s version of Ghost Town! We look forward to seeing you at the party this Friday night, August 24th! I have a couple of requests for pictures of Debbee’s newest creations for Spring. Here are a few samples of Debbee’s pieces that are available at American Harvest. Debbee will be bringing 25 one-of-a-kind pieces, but I do not have them in stock yet, therefore I have no pictures to show you! We hope to see many of you at the store on May 5th from 10am-5pm for the Debbee Thibault signing. You can call Sharon at the store 925-485-1577 for details and more information regarding these wonderful creations by Debbee. Remember, the above pictures are just a handful of Debbee’s creations now available at American Harvest. We have a very extensive line of her work, including Christmas and Halloween.